Procedure for determining clay minerals in concrete is almost same as that of methylene blue capacity for determining quality of bentonite as we are dealing with same clay minerals here. This is smectite. Bentonite is also clay of same group derived usually from volcanic ash. We have discussed numerous posts about bentonite and drilling fluids, mostly related to drilling of pile. 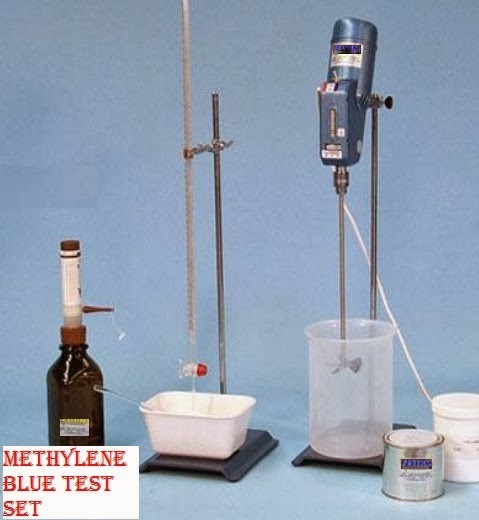 The test method is named as methylene blue absorption test and described by Pettifer and Hills in 1985. At first we like to introduce methylene blue; it is a dyeing pigment that is soluble in water usually of organic origin. When it is dissolved in water it produces blue color. When clay of swelling properties (smectite group) remains in aggregates the methylene blue don't produce blue color as it is absorbed by clay minerals. This phenomenon facilitates us to predict presence of clay minerals. The amount of methylene blue required, gives a measure of concentration of search clay minerals. The sample we like to test should be ground to make powder that will pass standard test 75 µm. Methylene blue is organic dyeing agent, used to determine clay minerals; here for concrete aggregates. We have already introduced this dyestuff. c. The solution of methylene blue is prepared by dissolving 0.1gm Methylene blue into 200 ml of de-ionized and distilled water. After each 0.5 ml addition, to disperse evenly, suspension is properly agitated for 1 minute then a drop of suspension is taken using glass rod and kept on filter paper to inspect for any blue color is left by Methylene blue. For each addition, the color is examined under sunlight, at the end of titration a circular band of pale blue is observed. The amount of Methylene blue is recorded to produce such color and our test is completed. Now what does titration means? Titration means there have no clay particles to absorb Methylene blue and blue color is appeared. This test method is used in France as standard test but has limited experience. The advantage of this test is it requires simple and usual chemical apparatus. Disadvantage is there should have a rock grinder to make powder of aggregate sample as discussed above.